I have always wanted to try Essie nail varnish but until this month I hadn't branched out from Barry M, Revlon and Rimmel. 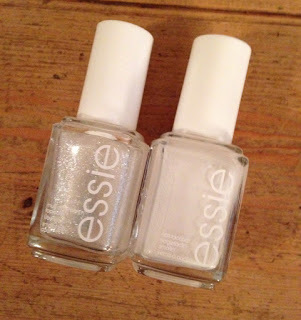 I admired Essie from afar, but didn't want to spend £7.99 if the quality wasn't good. A couple of weeks ago I was in Superdrug looking for a white glitter nail varnish and stumbled upon Essie's, I really wanted to get the pearly white nail varnish as well to go with it as a first base but couldn't afford it at the time. I got it the other day and I absolutely love the combo!! The duo creates such an elegant, classy and stunning result. I love it and it is also so christmassy, very angelic. The pearl shade would be perfect for a wedding and would pair amazingly with a wedding dress. I think it is subtle enough for a bride to wear and it is so pretty. 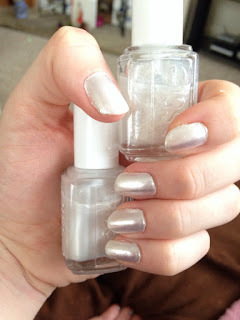 I was very happy with the quality of Essie, it doesn't chip straight away and stays on for quite a long time. I was shocked by how quickly it dries and the fact that I didn't have to wait hours on end doing nothing. You can put as many layers as you want on and it dries just as quickly, no waiting around with Essie. Essie is will worth £7.99 and I cannot wait to expand my collection, I really want to get some more glitter and reds.